An epidemic of violence is sweeping the country: musicians are being murdered onstage in the middle of their sets by members of their audience. Are these random copycat killings, or is something more sinister at work? Has music itself become corrupted in a culture where everything is available, everybody is a "creative," and attention spans have dwindled to nothing. With its cast of ambitious bands, yearning fans, and enigmatic killers, Destroy All Monsters tells a haunted and romantic story of overdue endings and unlikely beginnings that will resonate with anybody who’s ever loved rock and roll. 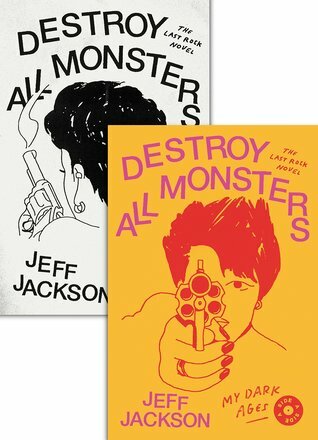 Like a classic vinyl single, Destroy All Monsters has two sides. At the heart of Side A, “My Dark Ages,” is Xenie, a young woman who is repulsed by the violence of the epidemic but who still finds herself drawn deeper into the mystery. Side B, "Kill City," follows an alternate history, featuring familiar characters in surprising roles, and burrows deeper into the methods and motivations of the murderers.